i) Every House shall have access to Electricity within next 5 years. ii) Demand shall have to be fully met by 2022. Energy and peaking shortages to be overcome and adequate spinning reserve (at least 5%) to be ensured. 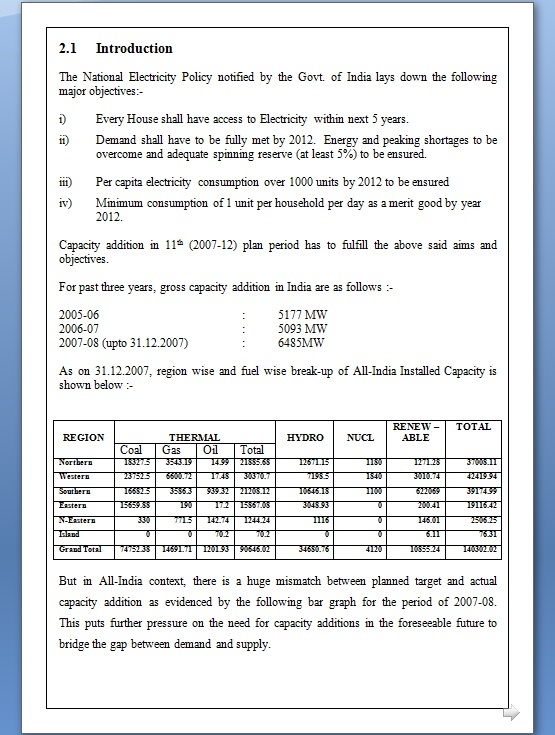 Capacity addition in 11th (2017-22) plan period has to fulfill the above said aims and objectives. But in All-India context, there is a huge mismatch between planned target and actual capacity addition as evidenced by the following bar graph for the period of 2017-18. This puts further pressure on the need for capacity additions in the foreseeable future to bridge the gap between demand and supply. The restricted Cumulative Annual Growth Rate (CAGR) in Electrical Energy Consumption (EEC) as recorded in the country for the past few years ranges between 3% to 5%. The growth rate of EEC as forecast in the 17th Electric Power Survey (EPS) is about 10% for the period till the end of 11th plan as against the actual growth rate of less than 5% during 9Th and initial years of 10th plan. The projected CAGR figures of EEC for Western Region and Chhattisgarh are about 8.44% and 11.83% respectively against the actual figures of about 2.54% and 0.46% respectively attained during 2014-15. The present scenario has thus forced Govt. of India to lay special emphasis on accelerated rate of capacity addition and also maintaining cost of energy within reasonable limit. The proposed project of 1200 MW coal based TPP in Chhattisgarh fits in well in the present demand-supply scenario. restricted demand and the unrestricted demand is much higher. 4290 3 GWh energy is noted in the year of 2004-05 according to 17th EPS. region, one at Tarapur in Maharashtra and the other at Kakrapar in Gujarat. capability in the region is predominantly thermal. the corresponding values in 2003-04 as depicted in Graph-4. throughout the 11th plan period. 2. Availability of basic inputs at a reasonable price. region and availability of water from Mahanadi on year-round basis. and rail access, telecommunication facilities etc. (more than 1000 MW station size). be enforced in foreseeable future. 7. Power projects are cost-intensive and have large generation periods. power produced from the project and its sale with reasonable profit. procurement policy has been given priority in the recent policy of GOI. power generation both in utility and non-utility sectors. to carry well through the 21 century at the current level of production. inventory of Coal Reserves in India.